Online social networks like Edmodo encourage students, like these King Elementary fifth graders, to give one another constructive feedback in a regulated setting that protects their privacy. When you think about using technology in the classroom, you might think of students tinkering with science, math or engineering projects. But King Elementary fifth grade teacher Karen Haddas is using Mac programs and social media to upgrade traditional reading and writing curriculum. Edmodo is an online social network that is similar to Facebook, but it’s classroom and lesson-centered, and it has much stricter privacy safeguards. 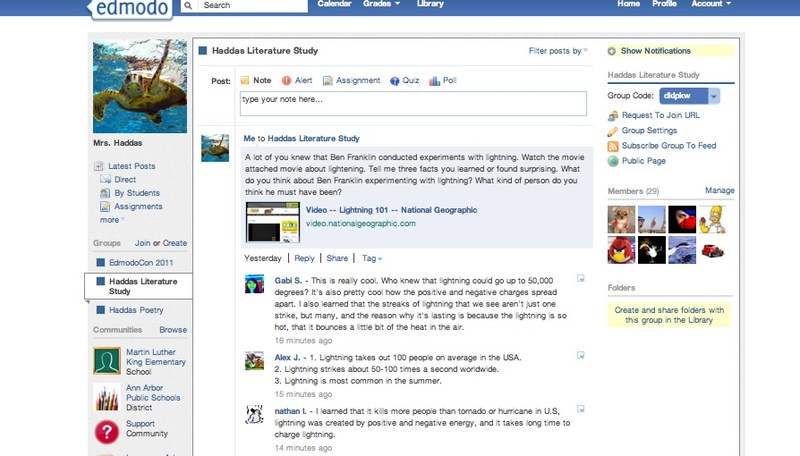 Teachers can post, structure and grade assignments, and also provide a forum for classroom discussion and collaboration. and they get feedback from everybody in the classroom,” Haddas said. Parents can also use the social network to look in on some class activity too, which is especially useful because Edmodo provides a space for the students to show off their digital projects. Haddas has taught her fifth graders to create podcasts and videos using Quicktime and iMovie. The projects encourage students to read their work aloud, whether it’s a poem or a persuasive essay or a book review, and pair their written and spoken work with images. A view of a the classroom discussion on Edmodo during Haddas’ fifth grade social studies lesson this week. (Click on photo to enlarge) Screenshot provided by Karen Haddas. Writing instruction now has gone beyond word processing, Haddas said. “We’re really looking at technology as a vital tool. It really is expanding their thinking and taking it to the next step,” especially through the creative possibilities it offers. With all the options for creating such cool projects, Haddas notices that students seem to feel even prouder of their work, whether they’re creating an avatar or inserting graphics into a presentation. One difficulty Haddas faces when using this technology is a logistical one: getting her technology-enthusiastic students enough time with the computers. On average, her students work with the school computers twice a week. “Honestly if I could, I would have (computer access) more often than that,” she admitted. “But I feel like, you can’t hog it. It’s not fair to other classrooms. I would like to have it 3 or 4 times a week, but I just can’t.” Haddas isn’t alone in her complaints. 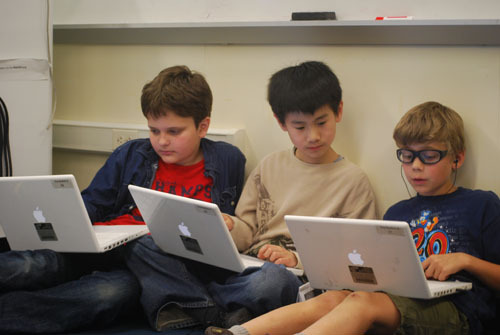 According to a recent survey, many other teachers note difficulty in getting their students enough computer time. Haddas is careful to plan most of the assignments that need a computer or Internet access to take place during the school day, because some students might not have access at home. She often has to work around the availability of computers and plan other kinds of assignments, even though her students are eager for more lessons that use online and creative technology tools. But even with the limited computer time, Haddas is impressed by her students and their enthusiasm for new technologies. We are a group of volunteers and starting a new scheme in our community. Your site provided us with useful information to work on. You have done a formidable process and our whole group can be grateful to you.